For further details, please see How to join the ServiceM8 Network. Sending a Network Request indicates that you want that business to either provide you with a Quote to perform work (a Quote Request), or you want that business to perform the work (a Work Order Request). Network Requests can be sent to any e-mail address. If the e-mail address matches a ServiceM8 account which has joined the ServiceM8 Network, the request will arrive in their ServiceM8 Inbox ready to be converted to a job in their ServiceM8 account. 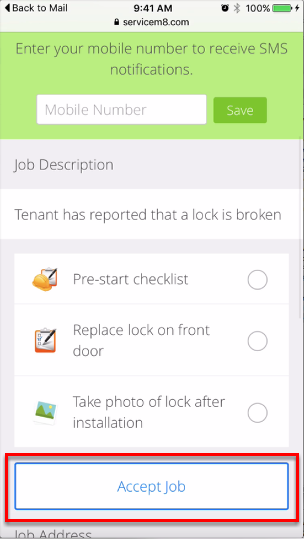 Otherwise, ServiceM8 will send a link to the e-mail address which allows the contractor to view the job details and complete the job requirements through any modern web browser (Google Chrome, Firefox, Safari, etc). For more information, please see How to send a Network Request. With the ServiceM8 Network add-on activated, any Network Requests sent to your business e-mail address (configured in Settings > Preferences) will arrive in your ServiceM8 Inbox, ready to be converted into a job. You will also receive a notification e-mail. To accept the Network Request, click the Convert to Job button. 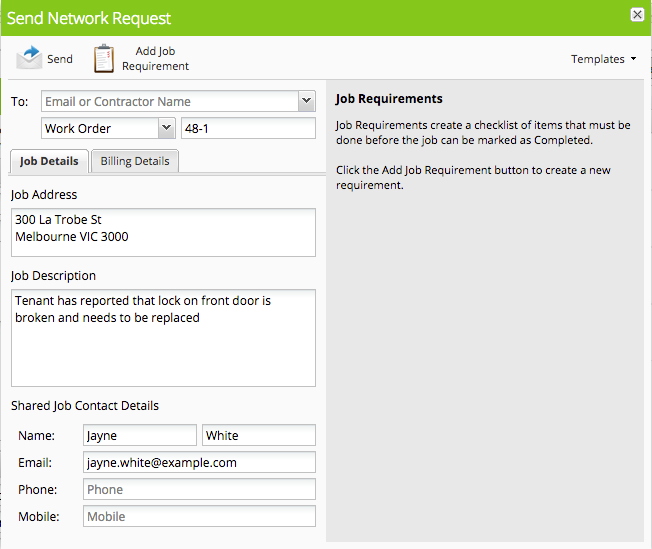 You can also accept Network Requests using the ServiceM8 mobile app. Go to the More menu, select Inbox, then select the inbox message and tap Convert to Job. If you receive a Network Request and you have not activated ServiceM8 Network, you will receive an e-mail similar to the above. 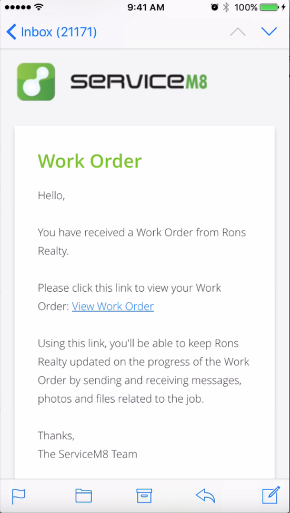 Click the "View Work Order" link to view the job details, accept the job, and complete the job requirements through any modern web browser (Google Chrome, Firefox, Safari, etc). Please refer to Overview of the web based job view for more details. Click the Accept Job button to notify the sender that you have accepted the job. As you complete the requirements of the Network Request, you should mark off each requirement as done. Simply tap a requirement to indicate that it's been completed (you may then select a photo/document, or complete a Form, if applicable). This will provide real-time feedback to the sender on the progress of the work. 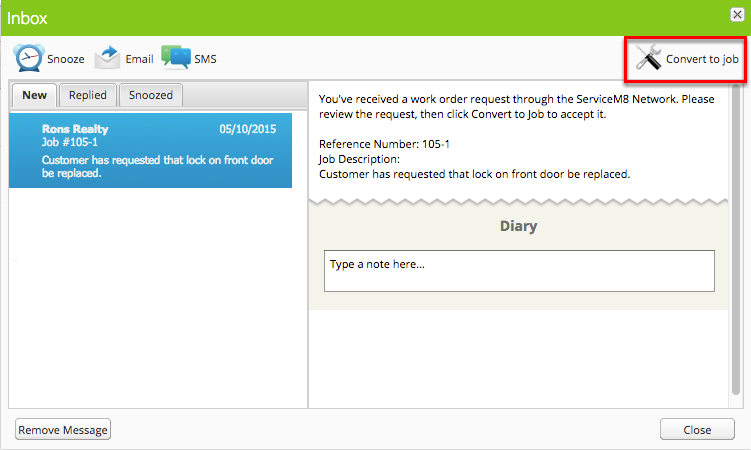 You can also use ServiceM8 Network to send and receive messages and files related to the job.